July 18, 2018, 2:07 p.m.
By Shan Wang @shansquared July 18, 2018, 2:07 p.m.
BuzzFeed has always had a branding conundrum. It produces fun quizzes people love to take, listicles centered around identities people love to share, and wildly popular food and recipe videos through its brand Tasty. It produces a ton of video series, like Pero Like and the Try Guys, or BuzzFeed News’ Twitter-native morning show AM to DM. It has dealings in Hollywood; it’s working with Netflix on a docuseries featuring its reporters, with Hulu for a documentary based on its investigations into R. Kelly. It sells merchandise, like Tasty cookbooks and fidget spinners with the word “chill” on them. BuzzFeed News has produced a Pulitzer finalist each of the past two years, and it regularly produces some of the most rigorous journalism around (for just a fraction: see here, here, here, here, and here). The challenge…— and, potentially, the big opportunity — will be to combine reporting and reach to maximum effect. And to combine the distractional element of BuzzFeed with the informational. And despite BuzzFeed News’ remarkable journalistic success in the years since, the general public seems profoundly unable to distinguish it from its sibling quiz factory. When the Pew Research Center polled Americans about what news organizations they trust or don’t trust, BuzzFeed finished dead last, 36th out of 36. It was the only news organization tested that was more distrusted than trusted across the political spectrum — from strong liberals to strong conservatives. The LOLs have proven a big hurdle for the news brand to overcome. But change buzzfeed to buzzfeednews in traditional URLs and so far as I've seen it redirects. BuzzFeed News doesn't have its own search either? Perhaps the content still resides in a shared database between the sites? Or if they do plan to make a move to a different database the move isn't complete? POSTED July 18, 2018, 2:07 p.m.
Wang, Shan. "The investigations and reporting of BuzzFeed News — *not* BuzzFeed — are now at their own BuzzFeedNews.com." Nieman Journalism Lab. Nieman Foundation for Journalism at Harvard, 18 Jul. 2018. Web. 20 Apr. 2019. Wang, Shan. "The investigations and reporting of BuzzFeed News — *not* BuzzFeed — are now at their own BuzzFeedNews.com." Nieman Journalism Lab. Last modified July 18, 2018. 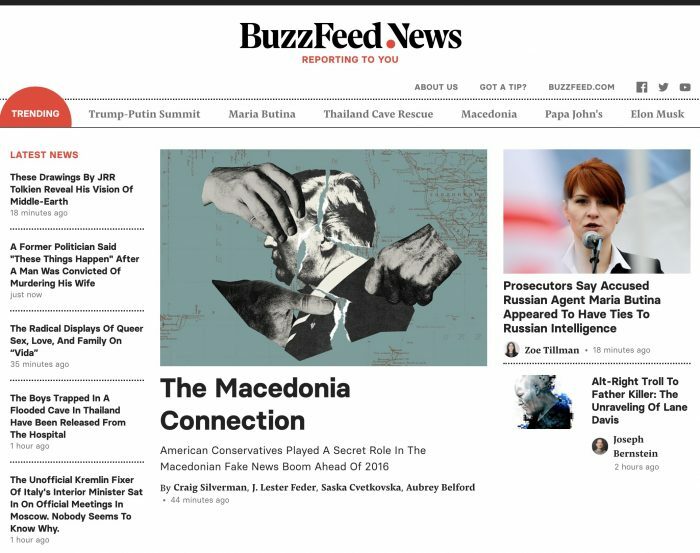 Accessed April 20, 2019. https://www.niemanlab.org/2018/07/the-investigations-and-reporting-of-buzzfeed-news-not-buzzfeed-are-now-at-their-own-buzzfeednews-com/.